Steve-O (a.k.a. Stephen Glover) has become a household name and it all started when he snatched a video camera from his father’s closet when he was fifteen years old. From there he started producing homemade skateboarding videos featuring dangerous stunts mixed with comical behavior. He was born in London and by the age of twelve, had lived in five countries and communicated fluently in three different languages. He holds citizenship in three countries - the United States, Canada and the United Kingdom. After finishing high school in London, and completing a year at the University of Miami, Steve-O realized that college wasn’t for him. He enrolled in Ringling Brothers and Barnum and Bailey Clown College to help further his goal of becoming a professional stuntman.After graduating Clown College, and determined to make it in Hollywood, he began to pitch his home videos to producers. Eventually, Steve-O’s videos made it into the hands of Jeff Tremaine (Jackass Creator/Director/Producer) who was working with Johnny Knoxville to create a stunt based reality show. The rest is history.MTV aired the first season of JACKASS in 2000. In 2001, Steve-O launched his own “Steve-O Don’t Try This At Home Tour”, establishing himself as an accomplished stage performer, at venues throughout the U.S. and in a dozen countries.When the JACKASS TV series ended in 2002, the team moved on to JACKASS: THE MOVIE, released by Paramount in October of that year. Shortly thereafter, Steve-O and fellow JACKASS alum, Chris Pontius, were given a spin-off show entitled WILDBOYZ, which aired on MTV and MTV2 and lasted four seasons.In 2006, Paramount released JACKASS: NUMBER 2 in theatres and Steve-O continued to thrill audiences with his outrageous stunts.In 2009 he competed on ABC’s hit show, DANCING WITH THE STARS, and lasted six weeks, despite an injury and having virtually no dancing ability whatsoever.In 2010, Steve-O returned for the Paramount franchise in JACKASS 3D which turned out to be a huge hit at the box office for the third installment with JACKASS 3.5 releasing shortly after on DVD.In the months leading up to the release of JACKASS 3D he immersed himself in standup comedy, which had been a part-time hobby during the previous four years. Successful performances at prestigious comedy venues such as LA’s Laugh Factory and New York City’s Comedy Cellar led to his current tour performing standup, stunts and bar-tricks across North America, Australia and Europe, which he has dubbed “Steve-O’s Entirely Too Much Information Tour.”On June 7, 2011 Steve-O released his autobiography, Professional Idiot: A Memoir, with publisher Hyperion Books.In 2012, Steve-O hosted the game show called Killer Karaoke for truTV. The show challenged contestants to break out in song in the midst of extreme, hilarious and sometimes skin-crawling situations.In 2013, Steve-O launched his YouTube channel where he has garnered almost 3 million subscribers. Adding to that his other social media platforms, Steve-O has an online following of over 13 million people, which is growing every day as he documents his continuing travels around the world. 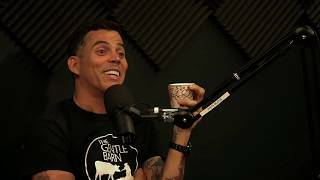 He uses the site to regularly upload new original material – mixing his stunt work with his comedy bits.Steve-O has been clean and sober since March of 2008 and lives a healthy, vegan lifestyle in the Los Angeles area...but he still has no problem stapling his balls to his leg.